It is time for another Makeup War! 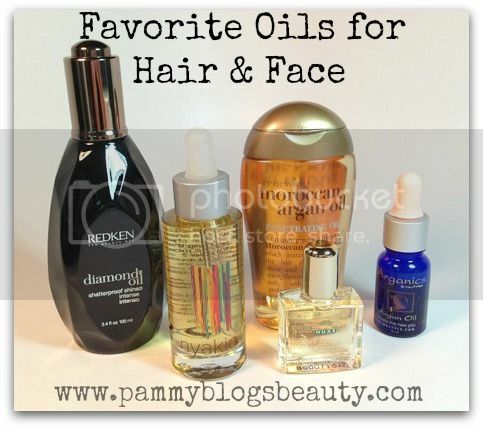 This time the Makeup Wars bloggers are sharing their favorite oils for both hair and skin! Read Makeup Wars: Find out what products Top Beauty Bloggers LOVE! Before sharing my choices for favorite hair and face oils, let me tell you a little bit about Makeup Wars in general. The Makeup Wars Bloggers are a group of top beauty bloggers that publish coordinated bi-weekly posts. The Makeup Wars bloggers collectively pick topics to blog about (e.g., Top 10 Products, Beauty Pampering, etc). Then, we publish our posts at precisely the same time and link up through the graphic links and thumbnails at the top and bottom of our posts. It is always a big surprise to scroll through the links from the group to see what everyone picked! Every single time one of our Makeup Wars publishes, I literally scroll through all the Makeup Wars blog posts making shopping lists, lol! Oil for Hair and Skin??? Have you ventured into the hair/skin oil realm yet? As someone with temperamental combo-oily skin (I'm pregnant...so, super oily through t-zone), using oil on your hair or face seems counter-intuitive, right? Well, just put aside any of your preconceived notions on oil for now. Oils for your hair and face are really a great thing! You will notice a trend here with the oils that I am using and loving...Argan Oil! Yes, Argan oil is one of the most buzzed about oils...and it really is a fabulous product ingredient! While I have not done any experimentation with the pure form of Argan Oil (mostly I have just used products that contain Argan Oil), I hear that it is fantastic used "straight". Josie Maran makes one (and it is probably the most "talked about"). I must try some pure Argan oils soon! Organix Moroccan Argan Oil Penetrating Oil: This is the most recent addition to my hair care oil arsenal! This is an "oil" specifically designed for your hair. It really is rather much more of a silicone-based serum than a true oil...but, it does have Argan oil as an ingredient. I love how my hair looks and feels after using this! I smooth on about a pea sized amount while my hair is wet (concentrating on the ends and working up). Then I proceed to style as usual. When I have finished drying/styling my hair, I smooth another pea sized amount just for extra shine. My hair always looks smooth, shiny, frizz-free, and soft when I use this! Plus, it retails for only like $6.99! Redken Diamond Oil Shatterproof Shine Intense: If you read my previous Redken Fall Hair Trend Preview and Diamond Oil Line review, then you know that I love Diamond Oil Shatterproof Shine Intense (if you haven't read it, be sure to click the link!). I won't go into full detail since I already reviewed it...but, I will tell you that I love it! This oil can be used on hair, facial skin, or your body. I really love how versitle this oil is! Usually I use it for my hair. However, if I do have a bit left over on my fingertips, I like to rub the oil into my cuticles. Plus, the glass bottle is super pretty! Great oil! Totally recommend!!! A 3.4 oz bottle retails for about $40 wherever Redken is sold. I know...that is pricey. However, the bottle is HUGE and you only need a few drops per use. NuMe Arganics Argan Oil: I think that I got this little sample is a Glossybox? This is a thick and rich serum-type argan-based "oil". I find that it works pretty similarly to the Organix version mentioned above. It leaves my hair soft, smooth, and comb-able. I love the shine and manageability it gives, too! I really like NuMe's hair care products in addition to their fabulous curling wands! This Argan oil serum helps to moisturize hair while also reducing your dry time! It retails for about $59. Nuxe Huile Prodigieuse Multi-Usage Dry Oil: Ooooh! I just love this multi-purpose (hair, face, and body) oil! This oil is one of those "cult favorites" that you hear about models and actresses using. I got this as a Birchbox sample and it really is one of my favorite samples that I have gotten from my Birchbox subscription! You only need the smallest touch of this oil to make a tremendous impact on your skin or hair. When I run out of this deluxe sample, I am totally buying a full size! This oil has the most lovely and intoxicating light scent! It hydrates your skin while leaving a slight sheen. For my hair, I use just a touch of this oil on the ends. My hair just seems to "drink" it right in! The oil blend is sweet almond, camellia, hazelnut, and macadamia. Nuxe Multi-Use oil retails for about $45 for 3.3 fl oz. Nyakio Hydrating Face Oil with Kola Nut: This oil is specifically designed for the skin. When I first opened it, I thought that I was not going to like it as it has quite a strong herbal scent (and typically I don't like using heavily scented products on my face). However, I gave it a try anyways. Well, I am so glad that I did as I really do like it! While I still wish that it was unscented (or carried a lighter scent), I do love what it does for my skin. I literally just use 2-3 drops for my entire face. I use in the evenings after cleansing and before treatment products. It leaves my skin smooth and hydrated! I feel like it plumps up my skin and makes fine lines less apparent. I love it! It retails for $49 for 1.0 fl oz (which will last forever considering that I only use 2-3 drops). So, that's it ya'll! Those are my current favorite oils for hair and skin!!! I would love to venture further into using oils for face, hair, and body. I would love to hear your suggestions! Have you missed our previous Makeup Wars? Be sure to check out these posts: Battle of the Taupes, The $20.00 Face Challenge, Battle of the Favorite Summer Lippie, the Most Expensive Face Challenge, the Best Brush, Favorite Fall Polish, Favorite Red Lipstick, Best Fall Look, Halloween Manicure, Favorite BB Creams, Favorite Mascara , Favorite Holiday Metallics, and Holiday 2012 Beauty Wishlist, New Year's Beauty Resolutions, 10 Things I Repurchase Over and Over, Beauty Pampering, Favorite Cream Shadows, Best Waterproof Makeup, and Summer Manicure, Complexion Helpers, Color Wars, and Favorite Hair Tools. Be sure to click on the thumbnails below to read my fellow Makeup Wars blogger's posts! Good ones!! I do love the Diamond Oil from Redken! That Organix one is pretty good, but I have to use it very sparingly! I love how you shared a couple of options! I love the Redken Diamond Oil! @Blushing Noir-True! My hair is so long and dry that I can get away with using a bit more. @Phyrra-I bet you would like it! I've yet to use the Redken on my face. I guess because it's Redken I assumed hair only. Thanks for the lesson. I love it on my hair. I really like the Moroccan Argan Oil! I'm just starting to explore Nyakio! I just love the Diamond Oil! Great choices. I love argon oil! I got a sample of that kola nut oil and OMGGGGG, I'm in love. Their scrub is pretty awesome too. @B-Ooooh! I have not tried their scrub yet! I really want to try the face oil! I use to be scared of oils on my face but now I know its ok!